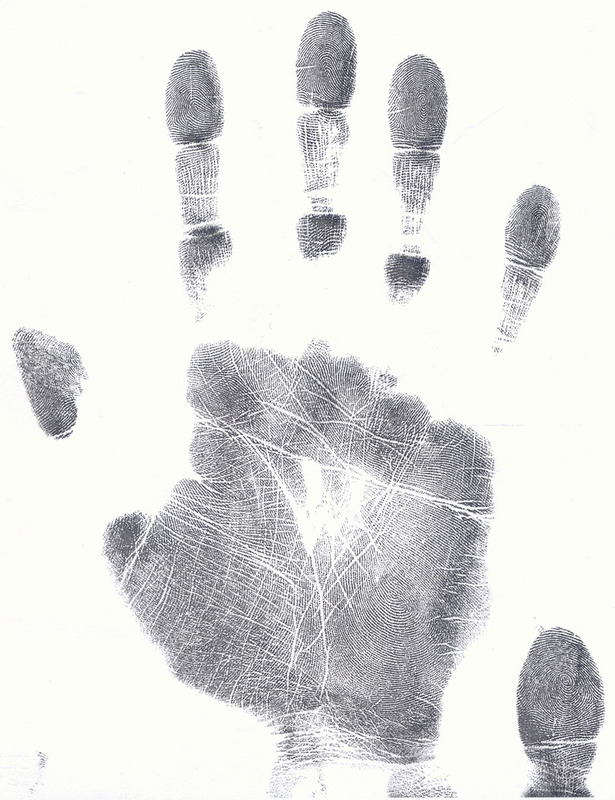 I have written a first post about how certain details fingerprints reveal info about serious medical problems. For congenital heart defects, the ridge count in all fingerprints plus factors of left vs. right asymmety appear to be an essential element. "For example: in 1989 a study revealed that the ridge count in the left pinky finger can become highly meaningful when it is summarized with the ridge count of the five finger of the right hand minus the ridge count of the five fingers of the left hand. In a population of people with congenital heart defects in Down syndrome, the summation outcome was typically (in 10 out of 13 individuals) lower than the ridge count of the left pinky finger itself. While among the control population (people who have Down syndrome without congenital heart defects) the same result was relatively rare (in only 1 out of 38 individuals)." Re: Fingerprints reveal clues about congenital heart defects! 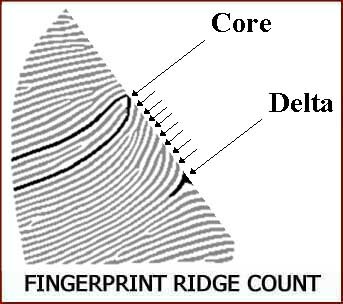 Usually the ridge count of the five fingers of the right hand is higher than the ridge count of the five fingers of the left hand (and this asymmetry difference is often quite large in especially in the thumb). Interestingly the 1989 revealed that in none of the 38 individuals without a congenital heart defect the left hand minus right hand digital ridge count resulted in a value higher than +4. However, in 7 of the 13 individuals with a congenital heart defect the left hand minus right hand digital ridge count resulted in a value higher than +4 (in four of these individuals the value was even 13 or higher). Additionally, in the congenital heart defect group in none of the individuals the value was lower than -10, while in the other group in sixteen individuals the value was lower than -10. CONCLUSION: This study revealed that a value above +4 could be used as a reliable indicator that the person had a congenital heart defect, and a value below -10 indicated that the person did not have a congenital heart defect. 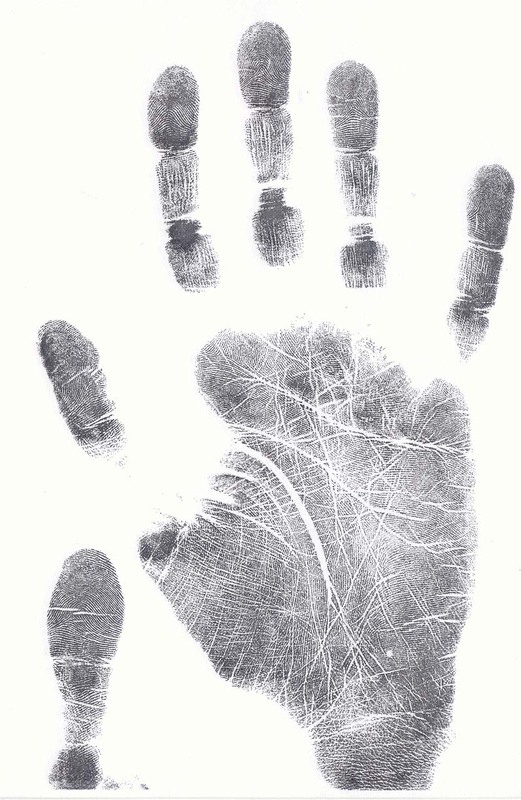 By the way, this person also has a high positioned axial triradius in both hands + an incompelete Sydney line in the right hand + asymmetric fingerprint types in 3 out of 5 fingers. 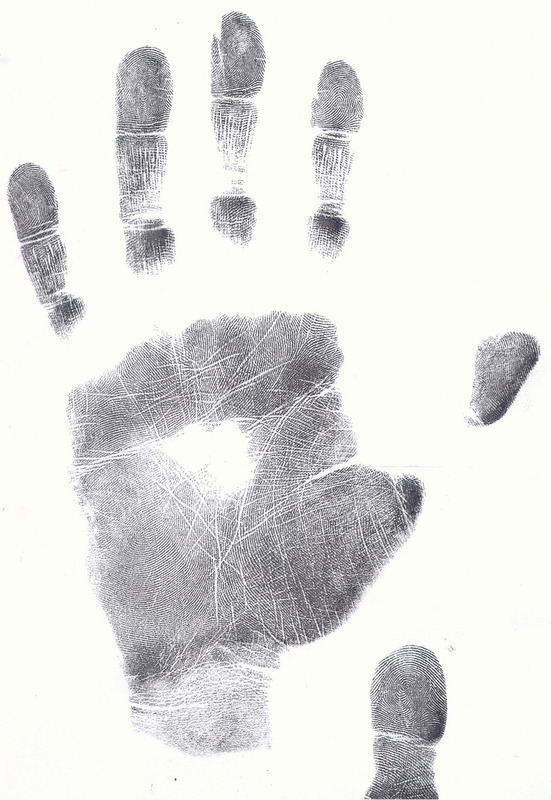 Here's another handprint of a male person who has a congenital heart defect (a septal defect). And by the way, the person also have an incomplete simian line in the right hand + two triradii and a radial loop on the hypothenar. very interesting Martijn. There are not enough hours in the day to keep up with your research topics! Usually the ridge count of the five fingers of the right hands is higher than the ridge count of the five fingers of the right hand (and this asymmetry difference is often quite large in especially in the thumb). There are other interesting features as well- I had thought asymmetry of the actual finger prints was better than say all arches or loops, wasn't that an indicator of an increase in adaptogenic disorders? I also see that in the man's hand there seems to be an absence of a triradii under the middle and a very distinct highly angled loop under the ring finger, any comments? "Usually the ridge count of the five fingers of the right hands is higher than the ridge count of the five fingers of the left hand (and this asymmetry difference is often quite large in especially in the thumb)." Felicity Martin wrote: ... There are other interesting features as well- I had thought asymmetry of the actual finger prints was better than say all arches or loops, wasn't that an indicator of an increase in adaptogenic disorders? Yes, I understand your point... no asymmetry at all on the fingers of both hands (monomorphic hands) is in general an unspecified risk factor. However, too much asymmetry is a likewise unspecified risk factor. In the heart defect group 3 person have asymmetric patterns on 4 out of 5 fingers (=5.6%), while in the control group there is only one person who hase the same characteristic (=1%). So, this confirms the significance of my point. Though in the male-case that I presented we observe the asymmetry on only 3 out of 5 fingers (in the study 7 out of 52 persons have this in the congenital heart defect group, and 11 persons have this in the control group). ... I guess, after seeing these results, asymmetry on 3 out 5 finger can not be described as a significant clue for 'congenital heart defects', but asymmetry in 4 out of 5 fingers can! The study shows that 3 out of 52 persons with a congenital heart defect have this (=5.7%)... but the percentage is even higher in the control group: 6 out of 100 have it (=6%). 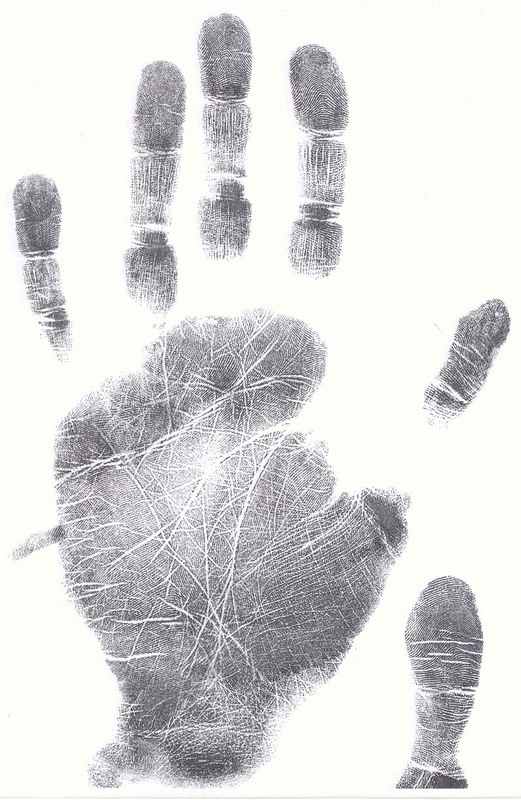 Though... a very high percentage of the congenital heart defect group has 5 'monomorphic' fingerprints in one hand: 16 out 52 persons = 30.7% (17% in the control group). Interestingly, 2 out of the congenital heart defect group have a 'monomorphic' hand combined with R-L asymmetry on 2 out of 5 finger (=3.8%); while in the control group only one person has this characteristic. CONCLUSION: Complex stuff, but regarding 'fingerprint pattern types'... asymmetry on 4 fingers is in this sample probably the most significant factor. By the way, the female case that I presented also has fingerprint asymmetries in 3 out of 5 fingers. Two out of the 52 congenital heart defect cases (=3.8%) have a radial loop on the ringer finger, combined with an arch on the index finger of the same hand + asymmetry on the ring finger + at least one asymmetry on one of the 4 other fingers. And there is also one case who has a radial loop on the middle finger and not on other fingers (+ a 'monomorphic' other hand). In the control group only one person has a radial loop on the ring finger, combined with a radial loop on the index finger in the same hand (both fingers are asymmetric compared to the other hand). The radial loop on the ring finger is also a relatively common marker in Down syndrome, not sure if it is more common among those cases who have congenital heart defects. PPS. Regarding the male case that I presented: I can observe the triradii under the middle finger, the 'angled loop under ring finger' is a relatively normal characteristic (though I can not share any statistics). Thanks a lot Martijn for the excellent and instructive response, I had a fair idea of what you intended, but thought there may bee some who could have been confused. I couldn't see the tridadii, maybe I haven't got the capacity the clearly see it on my computer. I will try again. The loop under the ring finger, according to old classical observations is supposed to indicate vanity- did the patient seem to have this trait? For those who may read this post, it has been stated by some hand analysts, that the same configuration on each finger increases the risk for cancer, or the reduced capacity to deal with carcinogens. Is there any contemporary references on this you could give? Could this be offset by a short index finger, and made worse by a long index finger, given the increase in autoimmune/allergy for the short index fingers. Thanks once again for a wonderful site and happy first birthday! In the male case that I presented the triradii under the middle finger are found just below the white zone. PS. The link(s) between finger length & cancer are rather complex: they vary among the sexes. For example: men are more at risk for prostate cancer with a LOW 2D:4D digit ratio, while women are more at risk for breast cancer with a HIGH 2D:4D digit ratio. And in other types of cancer the risk may vary differently (as indicated by other studies). thanks for that ratio information, I have several people I know with breast cancer and will make statistical observation records to supplement my understanding in this area. As to the triradii under the fingers of the left hand of the man. I can see the tridadii under the first finger and between the third and forth fingers, but the one between the or under the second digit, the Saturn finger or middle finger isn't apparent to me. It must be considerably displaced, or my eyesight or cognition levels are falling. My understanding, and what I normally find are triradii under each finger, and the displacement to either side gives and indication of the dominance of the traits associated with each finger. I was also interested in the loop on the upper part of the Lunar mount- which is often associated with memory according to old classics. Sorry to appear so obtuse. I think part of the problem here is that in the male prints the connections (creases) between the fingers & palm are not seen on the prints. For this reason, it could even be preliminary to talk about 'displaced triradii' - because the evidence is missing. I would say that for the right hand the triradius below the middle finger is positioned within the normal range... because it's location is observable due to the HORIXONTAL ridges - for the left hand I can not give a permanent conclusion. PS. I did not make these prints myself. I can see, for other reasons, why heart challenges may exist. This person has a lot of armoring on the heart line.